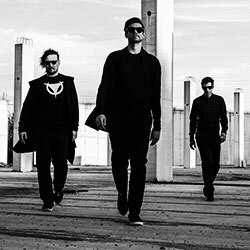 Torul are an active and prominent synthpop/dream pop/indie electro band of three from Ljubljana, Slovenia, who have released five albums in last six years, each with successful singles that topped charts around Europe and Russia and accompanied by music videos. For the last five years, Torul have been touring mostly in clubs and festivals around Europe, having appeared on stages in UK, Germany, Sweden, France, Poland, Serbia, Croatia, Slovenia, Austria and Russia. Last year Torul managed to overcome the loss of their second singer/front man Jan and in September the very new album Reset saw light after the path was set by the first, very well accepted single and music video Saviour of Love, which also introduced the young new singer Maj Valerij. Both are being very well received by both fans and reviewers. Torul have been known for original and powerful vocal arrangements, melancholic, yet not depressing music, and have been enjoying great response by crowds during their charismatic live performances in many international venues around the world.